The UFC welterweight division is about to receive some much needed clarity. Tyron Woodley successfully defended his belt for the fourth time last year, dominating Darren Till and hardening his status as the best 170lb-er in the sport. But since then an injury to his thumb has led to some time off, leading to UFC 233 scheduled for this month being cancelled. Then interim welterweight champion Colby Covington seemingly turned down a unification bout, with both fighters drawing the ire of UFC president Dana White and Covington being stripped of his belt. The figure lurking in the background of the welterweight title picture is Kamaru Usman, who is 8-0 in the UFC. His ambition is to be rewarded with a title shot at UFC 235 in March. Ariel Helwani reports that the fight is a done deal for March 2, and will serve as the co-main event to the reported Jon Jones vs. Anthony Smith bout. 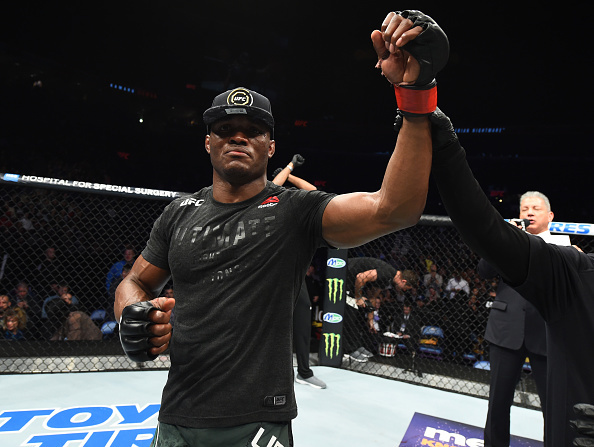 That ambition we spoke of in comparison to that of Covington’s seemingly tipped the balance in favour of the Nigerian nightmare, who like Colby earned a dominant win over Rafael Dos Anjos in his last outing. If the fight does occur at UFC 235, it’s sure to be a blockbuster card, with confirmed fights so far including Ben Askren’s UFC debut against Robbie Lawler, a featherweight barn-burner in Jeremy Stephens vs. Zabit Magomedsharipov, and Holly Holm taking on the undefeated Aspen Ladd.